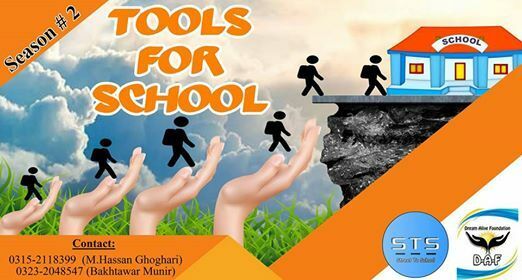 "Tools for School" is a fund raising campaign that was initiated in 2017 for the purpose to equip Street To School - STS children with stationery and related provisions for their daily use. 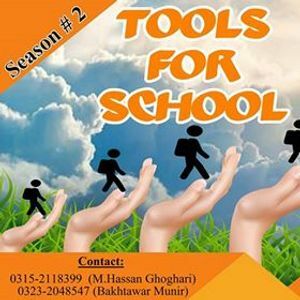 This year we come up with Tools for School Season 2. Street To School - STS is providing free of cost education from past 5 years to the children of Gharibabad. Currently, STS have fully functional Montessori class, Kindergarten sections, Adult Class for children who have crossed the age of preschool but have not been in a school before, here we make them able to join their age group. We also have classes for mothers that comes under adult literacy program. This year again we are taking new admissions to equip more children with free education. It will eventually increase our monthly expenditures and teacher's salary. Street To School - STS is giving you a general public opportunity to sponsor a vulnerable child back to school and those children struggling with the cost demands of education. Street To School - STS in collaboration with Dream Alive is initiating a fund raising campaign that will progress through different educational institutions. All proceeds raised from this fundraising campaign will be solely poured directly into our Street to School-STS fund. Let us pledge to create an inclusive and equitable world for children from underprivileged areas and promote education for all.